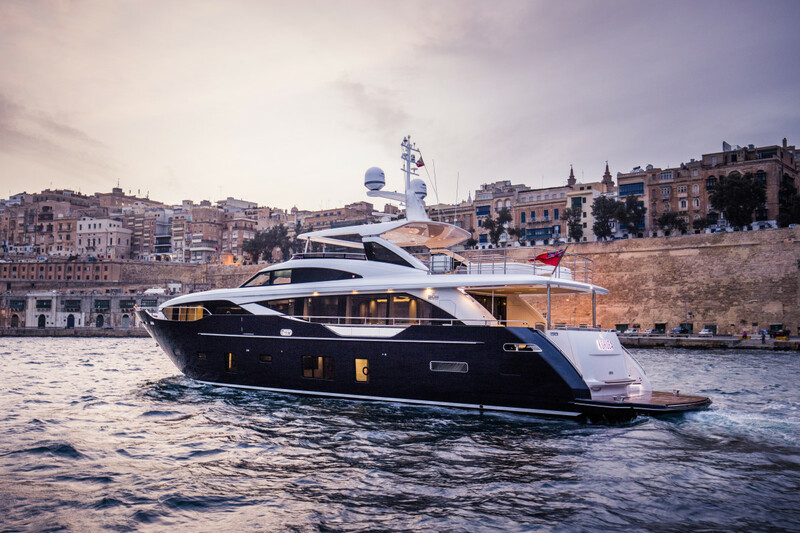 Designed as part flybridge motoryacht and part luxurty superyacht, the Princess 30M delivers the best of both worlds. They say you never get a second chance to make a first impression. When I saw the Princess 30M, she was anchored in a quiet bay a few miles west of Port Adriano on the southern coast of Mallorca, Spain. It was abundantly clear that her first impression would do just fine. Her rich, dark blue topsides extend to the top of her bulwarks, disguising the proliferation of tinted hull windows. 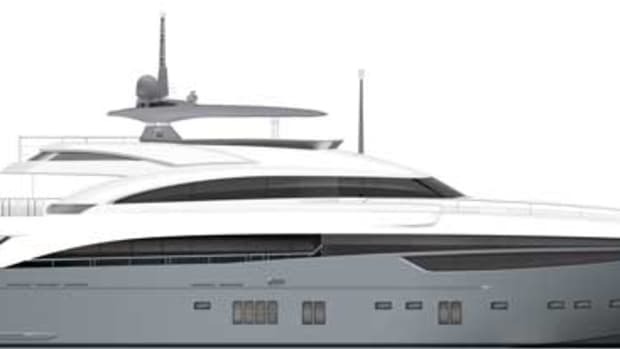 The topsides architecture includes an arch that rises gracefully from her stem to the after tip of her flybridge. A second sweep bisects that arch, running from the top of the pilothouse down to the stern, where it segues into the transom. 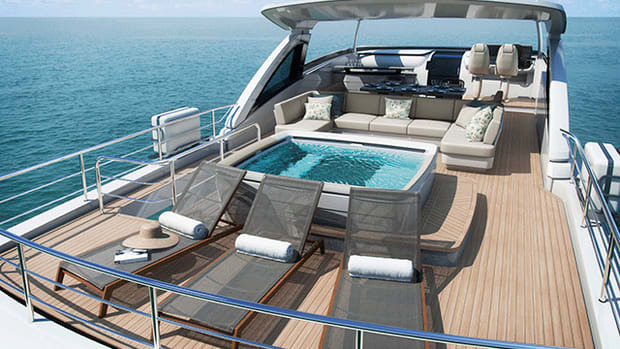 Two years of development at Princess have paid off: The 30M is a very handsome yacht. The 30M, at a length overall of 99 feet 11 inches, replaces the Princess 98 Motor Yacht, but the new model is a vessel all her own. 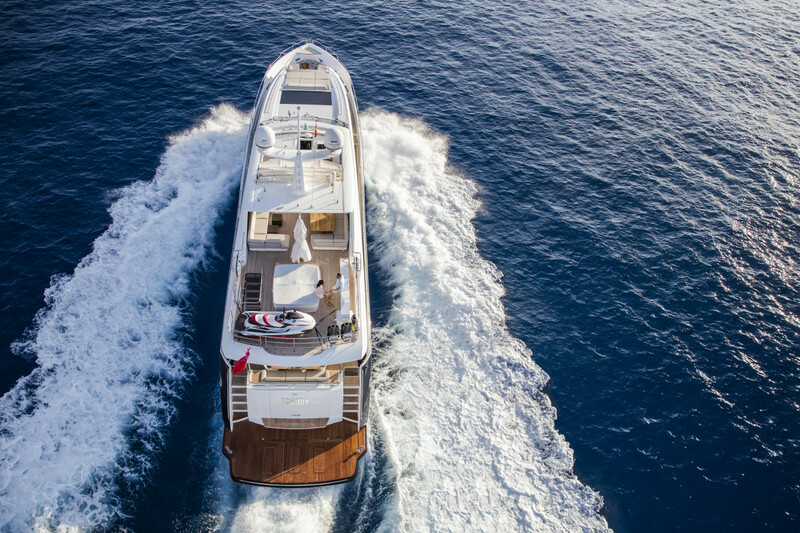 Whereas the 98 had a full-beam master stateroom on the lower deck, the 30M’s is forward on the main deck, in keeping with traditional superyacht layouts. Windows on either side have cutaway bulwarks for uninterrupted vistas, and overhead glazing throws yet more natural light. The detailing is good too: I noticed it in the floating occasional table and chairs. And the natural light continues into the ensuite, which is forward and lined in pale marble. 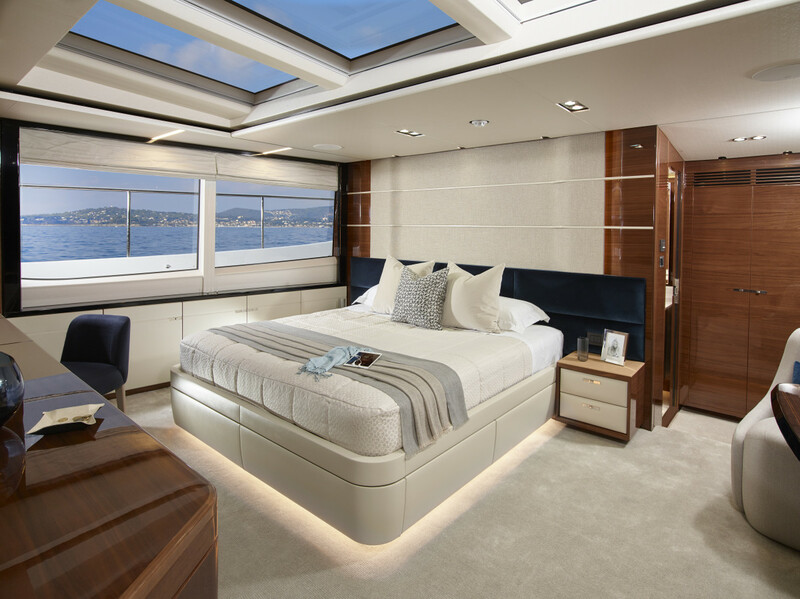 A raised pilothouse and a main-deck master stateroom with skylights set this yacht apart from the Princess 98 it replaces. Abaft the master stateroom is an enclosed galley with access to the crew cabins, plus a side door to the portside deck and direct access to the formal dining room. The setup lets the crew remain separate from the guest areas while working. 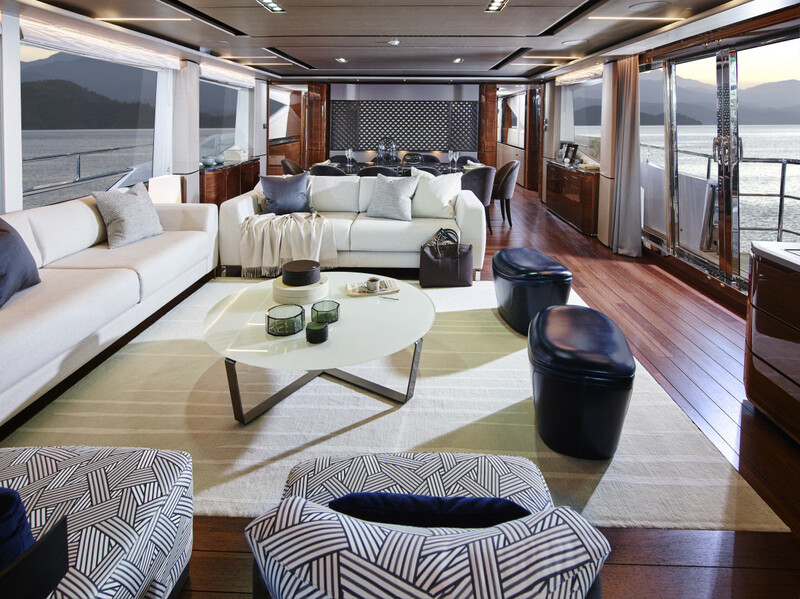 Continuing aft is the salon, again with extensive glazing and natural light—plus sliding glass doors to a drop-down balcony on the starboard side. 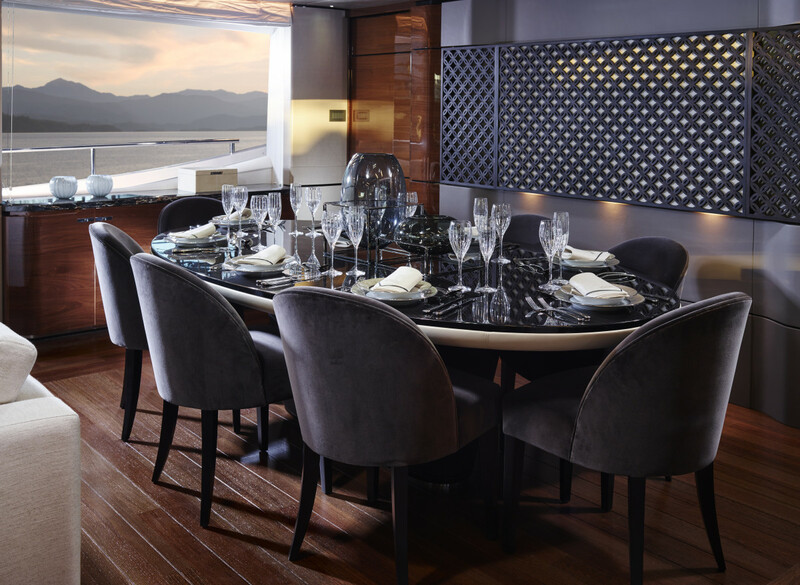 Princess Yachts International creates and manufactures the 30M’s furniture in-house. 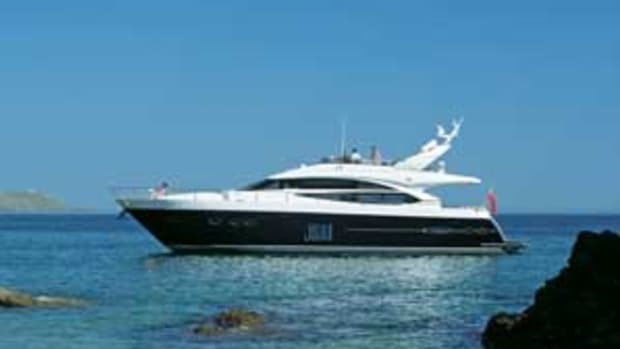 Princess Yachts says that 85 percent of the yacht is manufactured and built in-house, at its yard in Plymouth, England. This fact becomes all the more impressive when considering such details as the oval dining table. Finished in high-gloss Makassar ebony with cream leather padding beneath, it could grace any high-end furniture boutique. This piece, like almost everything else from the hull molding to seam welding, appears to be integrated. Only the engines and electronics are third-party sourced. 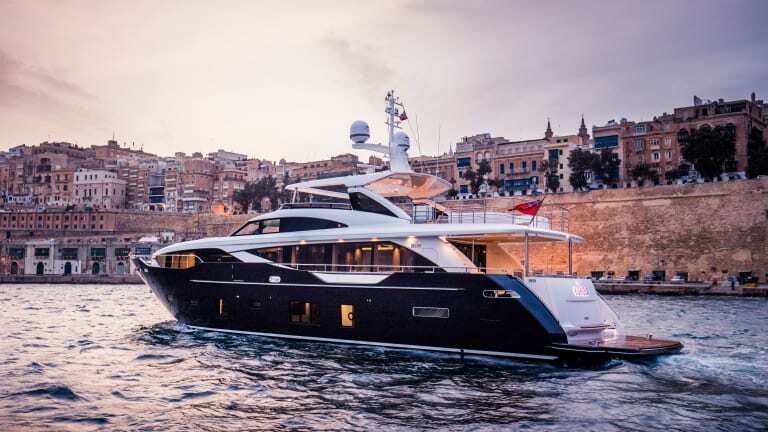 The Princess 30M comes with a standard layout that is largely fixed, although owners can change the four equal-size guest staterooms on the lower deck into two staterooms plus one VIP suite. 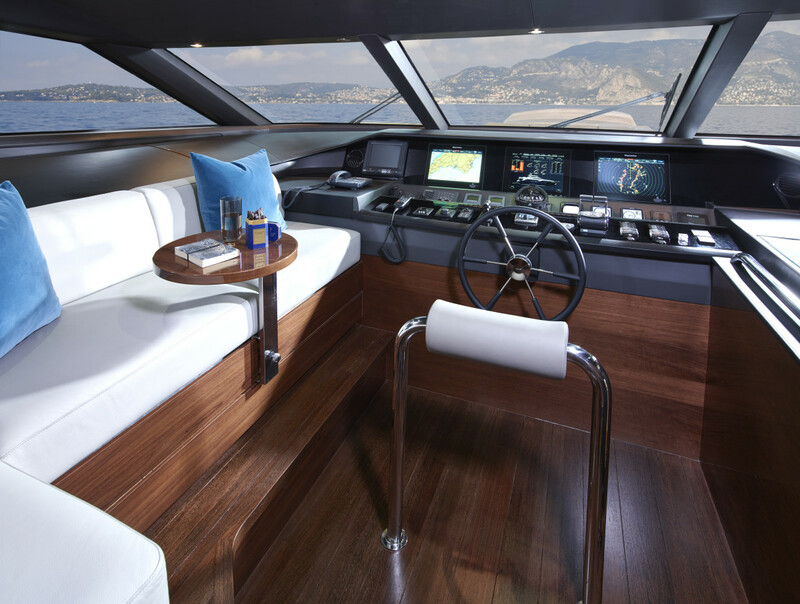 Further customization is available on the flybridge, where the upper helm is fixed and everything else is up for grabs. My test yacht had an optional hot tub forward with a custom 1.2-ton Opacmare crane aft—to lift a bespoke display case of stainless steel and glass, containing a prized motorcycle. 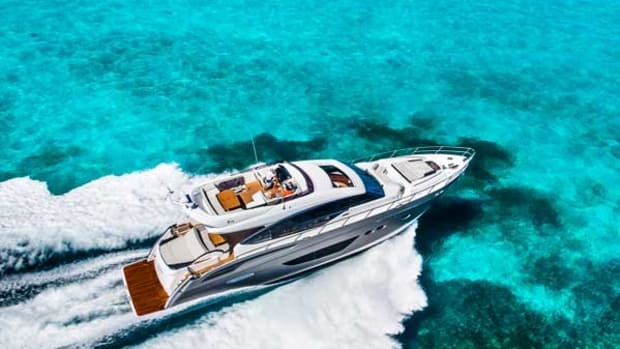 Some of the Princess 30M’s flybridge-crossover appeal can be seen in her specifications. The load line length is just below 78 feet (24 meters), meaning that an MCA MGN 280 designation, for small vessels in commercial use, is all that an owner would require to put his yacht into charter. 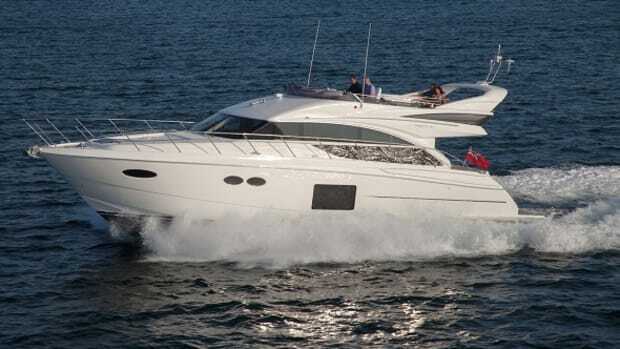 The Princess 30M also has a draft of 6 feet 9 inches (2.06 meters), ideal for shallow areas including the Bahamas. The tender garage for a 15-foot (4.5-meter) Williams Dieseljet should make gunkholing fun and easy. 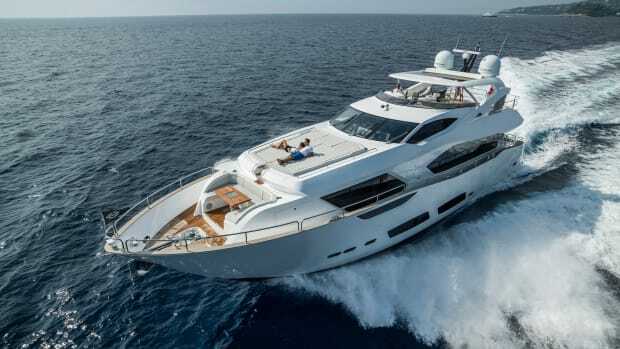 But to really understand the dual-purpose nature of this yacht, you need to fire up the twin MTU 16V 2000 M94 engines and unleash their combined 5,000-plus horsepower. They transmit their power through V-drives, and thrust-bearing couplings allow gearboxes to be soft mounted, considerably reducing noise and vibration, even in the lower-deck after staterooms. 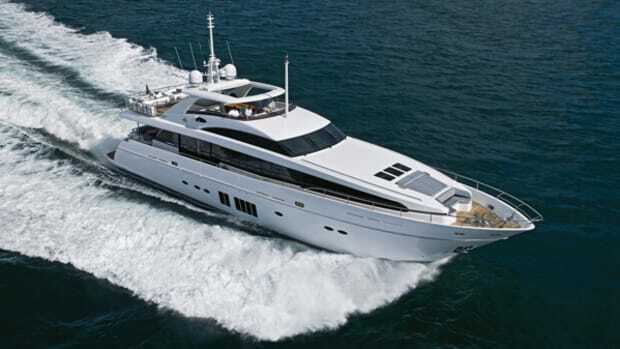 At 10 knots the Princess 30M sips diesel at just over 26 gallons per hour, for a range of more than 1,000 miles. 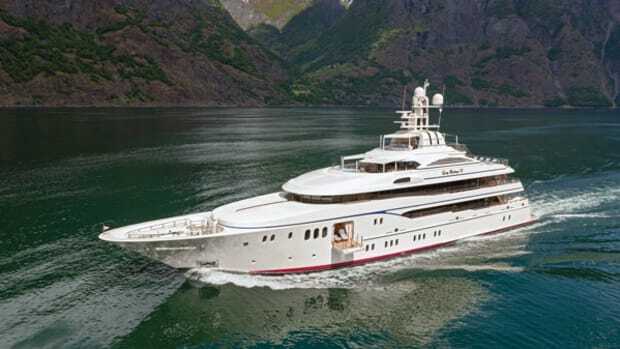 Ease the throttles forward, and the result is decidedly sporty, with the Bernard Olesinski-designed planing hull lifting its 100 tons and running with alacrity. Princess Yachts International claims to have seen almost 30 knots out of this boat, which is entirely believable, given that she nudges 27 knots fully loaded. The Princess 30M works well at both displacement and planing speeds, so owners can extend range or shrink time between ports. 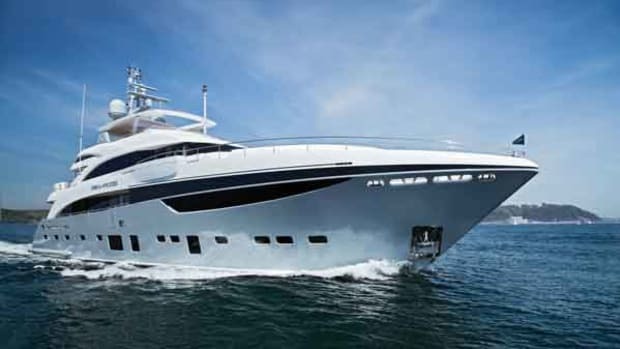 The Princess 30M delivers in spades on her crossover promise. 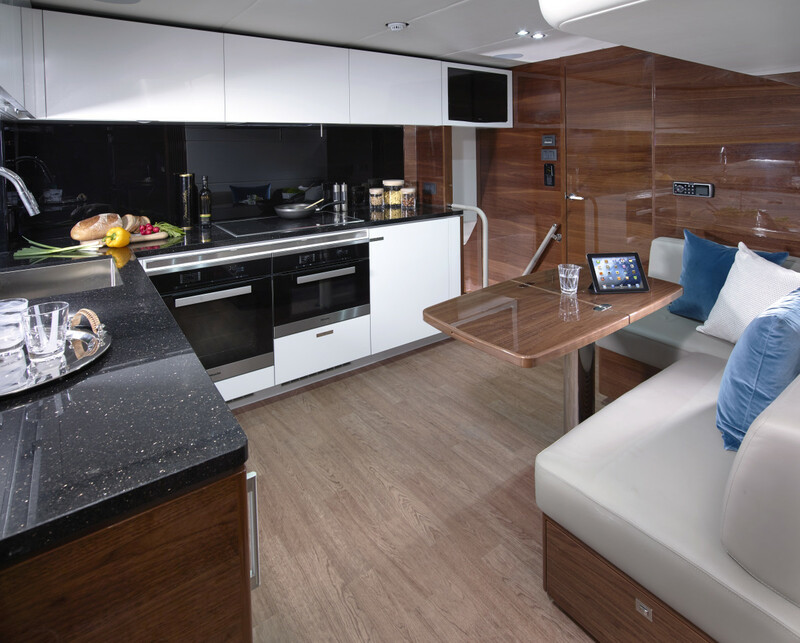 The builder nailed the flybridge benefits part of the brief while allowing superyacht features to shine through.